Despite its high percentage of bicycle commuters and forthcoming bike share program, Philadelphia is falling behind when it comes to building protected bike lanes. The Better Mobility 2015 platform calls on the city to add 30 miles of physically protected bike lanes to Philly streets. For this week's Agenda 2015 op-ed, the Bicycle Coalition of Greater Philadelphia's Sarah Clark Stuart makes the case for this infrastructure upgrade in terms of safety and ridership. When they were installed in 2009, the bike lanes on Spruce and Pine were amongst the first of the nation’s “buffered” bike lanes; six-foot wide bike lanes with a three-foot wide painted buffer that separated bikes from the adjacent travel lane. Philadelphia now boasts 11 different corridors that have buffered bike lanes. In addition, the more than 200 miles of five-foot standard bike lanes puts Philadelphia as having the largest inventory of bike lanes of east coast cities. 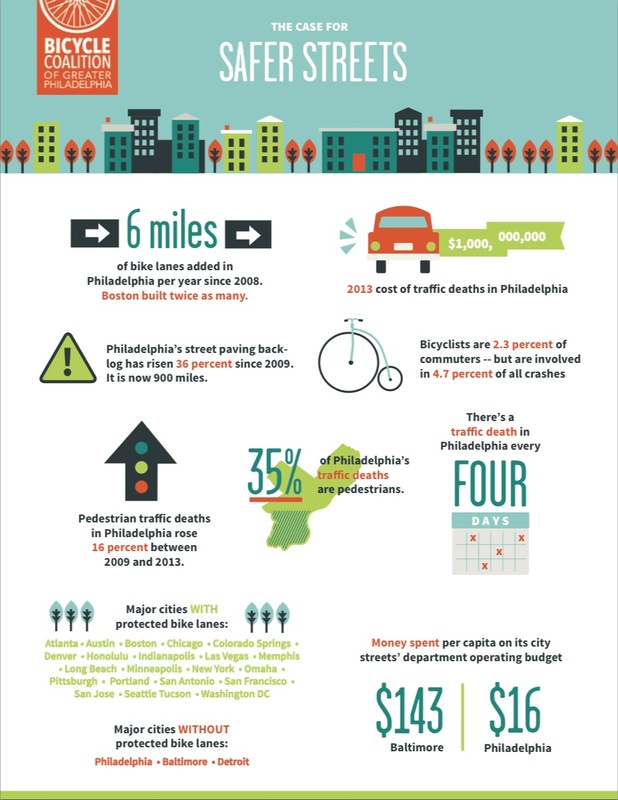 But over the past five years, Philadelphia has been bypassed by other cities that have installed more innovative bicycle infrastructure, and, as the Bicycle Coalition of Greater Philadelphia noted in our Safer Streets report, Philadelphia is quickly getting left behind. By one count, over fifty other American cities have physically protected bike lanes—a lane that is separated from motor vehicle travel lanes by some kind of physical structure, such as curbing, plastic posts, or parked cars—including Portland, Oregon; New York City; San Francisco; and Chicago. Less likely cities, like Fairbanks, Alaska and Indianapolis have installed their own protected lanes. Pittsburgh now has three physically protected bike lanes. And Philly’s protected lanes? There’s a quarter mile of the Central Delaware Riverfront Trail alongside Spring Street and Penn Street (above) that’s physically protected from the street, but it feels and acts more like a multipurpose trail than a bike lane. And the lack of protected lanes is hurting our city. Both in terms of safety and ridership. A national survey by Breakaway Research Group for the non-profit organization People For Bikes found that fifty-two percent of adults are worried about being hit by a motor vehicle while riding a bicycle. How to give them a better sense of security? Our intuition says an increased presence of protected bike lanes. So does the survey data. Forty-six percent of adults would be more likely to ride bicycles if they were physically separated from cars, according to the survey, and more than half of all Americans would like to bicycle more often and perceive bicycling as a convenient mode of transportation. If Philadelphia expects to increase its “mode share” (the percentage of commuters who bike three days a week to work) from 2.1 percent to 6 percent by 2020, which is a goal it set for itself in its 2012 Pedestrian/Bicycle Plan, then building bicycle infrastructure that makes more people safer while riding is an imperative. You don’t have to look too much further than Market Street and JFK Boulevard to recognize that these two streets (which have more lanes than I-95) would be perfect for protected bike lanes. They are overly wide and a traffic study found that they can be narrowed without impacting motor vehicle traffic flow. The Bicycle Coalition of Greater Philadelphia recently proposed that car-protected bike lanes (in which when the bike lane is next to the curb, and a row of parked cars buffers between people on bikes and motors vehicles) would make sense on those streets. Center City District and the Mayor’s Office of Transportation and Utilities support an eastbound protected lane on Market, and a westbound lane on the south side of JFK Boulevard. Other Philadelphia streets could also accommodate protected bike lanes. Sixth District City Councilman Bobby Henon is interested in seeing a protected bike lane installed in his district and is exploring the concept of one on State Road with the Streets Department. Among many other roads throughout Philadelphia that have the width and capacity for a protected bike lane are Roosevelt Boulevard, Erie Avenue, and 33rd Street and Chestnut Street in West Philly. But, getting these types of lanes installed requires the approval of City Council—a power the legislative body gave itself in 2012, and thus far, no ordinances have been introduced. In fact, Council has, in one case, rejected the Planning Commission and Streets Department recommendation for a bike lane that didn’t even require legislation: a five-foot standard painted striped bike lane on 22nd Street, resulting in disconnected bicycle network and a street that is more dangerous for bicyclists than necessary. We need more council members to step up for their bicycle-riding constituents and that is what Councilman Bobby Henon is now doing. More councilmembers should follow his lead and pro-actively work with the Streets Department to find appropriate streets for these high quality bike lanes. The longer Philadelphia goes without protected bike lanes, the longer all road users are at risk. It is imperative that Council does what is right to promote the public health and economy of Philadelphia by allowing protected bike lanes to become part of the fabric of our city’s streetscape.